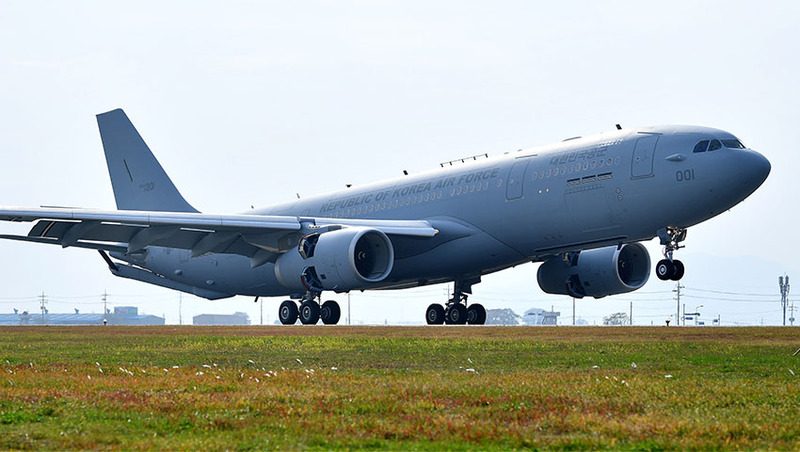 The Republic of Korea Air Force (ROKAF) has officially taken delivery of its first Airbus A330 Multi-Role Tanker Transport (MRTT) aircraft, making the nation the third regional operator of the aircraft behind Australia and Singapore. In South Korean service, the A330 MRTT will be powered by Rolls-Royce Trent 700 engines, be equipped with the Airbus Refuelling Boom System, and can be configured in a variety of layouts to carry more than 270 passengers and freight or for medevac operations. More than 12 nations have ordered over 60 A330 MRTT aircraft, including Australia, which has six KC-30A (as the aircraft is known in Australian service) in action and one additional aircraft on order. The KC-30A/A330 MRTT is fitted with two forms of air-to-air refuelling systems, an advanced refuelling boom system mounted on the tail of the aircraft and a pair of all-electric refuelling pods under each wing. The KC-30A/A330 MRTT can operate 1,800 kilometres from its home base, with 50 tonnes of fuel available to offload for up to four hours. In its transport role, the KC-30A is capable of carrying 270 passengers. It comes with under-floor cargo compartments that can accommodate 34,000 kilograms of military and civilian cargo pallets and containers. Australia’s KC-30As are operated by No. 33 Squadron from RAAF Amberley in south-east Queensland and have marked a number of major operational milestones in 2018. Airbus offers a comprehensive range of passenger airliners from 100 to more than 600 seats. Airbus is also a European leader providing tanker, combat, transport and mission aircraft, as well as one of the world’s leading space companies. In helicopters, Airbus provides civil and military rotorcraft solutions worldwide. In 2017, Airbus generated revenues of €59 billion restated for IFRS 15 and employed a workforce of around 129,000.